The big picture conclusion seems inescapable: the Industrial Revolution lifted humanity, wholesale, out of misery and squalor. Environmentalists have spent decades lamenting the Industrial Revolution. In their view, we all lived in Eden once. Then noisy, smelly machines came along and ruined paradise. Research analyst Luke Muehlhauser presents another perspective. He’s the author of an essay titled How big a deal was the Industrial Revolution? The short answer is that it was the single most important thing ever to happen to humanity. political freedom (the percentage of people who live in democracies). These lines speak volumes. For the vast majority of human beings who’ve inhabited this planet – generation after generation, century after century – life was precarious. Almost everyone was poor. the transformative impact of the wheel or writing or money or cavalry, or the conquering of this society by that other society, or the rise of this or that religion…or the Scientific Revolution. 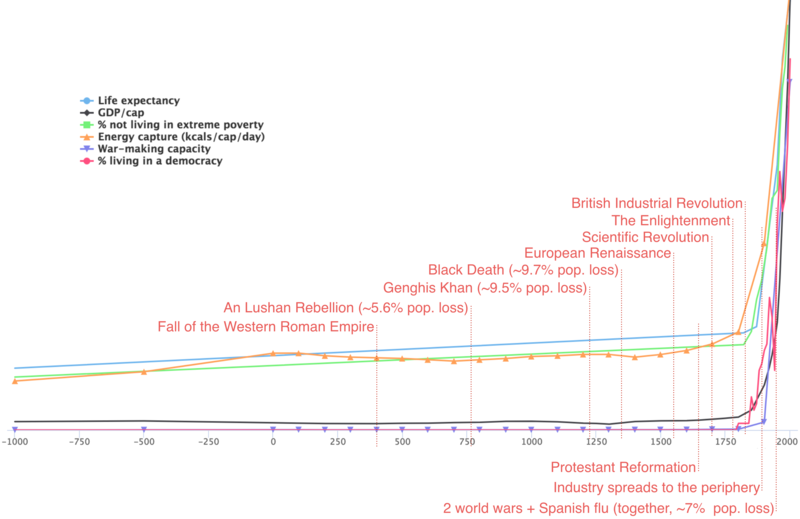 Everything was awful for a very long time, and then the industrial revolution happened. David Suzuki is right, to some extent. Many industrial processes produce pollution. But then something else occurs. Human populations that emerge from desperate poverty soon acquire sufficient good health, education, and financial means to clean up that pollution. Once we humans have enough to eat, once half our children no longer die before age five, we start to care about the environment. The crucial point is that, in order to get to stage B, you first need to pass through stage A. How big a deal was the Industrial Revolution? This entry was posted on November 14, 2018 by Donna Laframboise in historical perspective and tagged historical perspective, Luke Muehlhauser.